Haunted house made from a cereal box and 1:24 scale free printables, with Playmobil people to show the scale. Photo copyright 2009 Lesley Shepherd, Licensed to About.com Inc. Haunted style houses for miniature Halloween scenes or a railway or dollhouse display are easy for any age group to build using these free printables and recycled brown paper (kraft) bags and empty boxes. The individual pieces can be adapted to many shapes and styles. This particular project is the simplest to build and features rough sawn siding made from torn kraft paper on a cereal box base. In the photo above the box was cut across the top to form the tower. A wide range of simple bungalows to elaborate buildings are possible with the various printable pieces. The cereal box can be modified to make a two story house with a tower, you can add a porch or a traditional or mansard roof, and glue printable windows and doors in place on the front, or cut the panes open and use them to cover openings and fill the box with a flickering cool running battery candle flame to show off your house in a display. Mix and match the pieces as you want, or add in details from other printable houses like the tombstones and crypts from Ray Keim's Paper Model Purgatory. You can make these houses flat to be used as silhouettes, with cut out windows backed with tissue paper if you want, or you can make them from cereal boxes as small vignettes, and place scenes into the box from the back. If you have an existing set of miniature Halloween village buildings, you can make a set of these as silhouettes in a similar size to serve as a background for your Halloween display. In 1:24 scale the houses can be used with dolls house scale dolls in 1:24 scale, or simple people from the Playmobil toy line, which are available singly in a range of costumes suitable for Halloween trick or treaters. 1:24 scale also allows you to include some of the larger accessories from standard Halloween village lines. The Victorian style gate on the right of the house in the photo on this page is from Lemax's Christmas village line. They produce a wide range of Halloween figures and lights that would fit this scale of haunted house. Free printable paper trims, a brown paper bag, a cereal box, scissors and glue are the main materials used to make haunted house silhouettes or buildings. Photo copyright 2009 Lesley Shepherd, Licensed to About.com Inc.
Kraft Paper from a grocery bag or a piece of kraft paper from a parcel. Old envelopes can be used as well. Glue Stick or PVA (white) glue and a spreader. Sharp Scissors to cut out printable parts. Old Stiff Paint Brush to dry brush a texture on your kraft paper siding. Ruler to measure and mark the position of any printable details. Matte Acrylic Paint in your choice of colors to dry brush onto your siding to make it look old and worn. In the photos I used black so that you could easily see it. You get a more realistic siding effect if you use a dark color of paint normally found on Victorian houses. Printable Building Details - see later page for list and sizes. Printable doors and windows for miniature haunted houses. Photo copyright 2009 Lesley Shepherd, Licensed to About.com Inc. The majority of haunted houses in miniature displays seem to be Victorian houses with mansard roofs and wooden porches. Before you begin your project, look at reference photos to see the wide variety of styles commonly used. You can look up haunted house silhouette on any good search engine and bring up a number of images to give you ideas. Check your available recycled boxes to see what size of house you might be able to build from your stock. If you are building a silhouette or only the front facade of a house to go against a wall, you can cut out any basic house shape from cardboard and work on top of it. If you want a house in a particular size (1/24 scale or 1:48 scale to go with an existing set of villages), check the printables pages for the size of printable parts you will need. Straight and mansard roof sections, porches, porch posts, doors, windows and shutters are available in this particular set of printables in two sizes which are approximately 1:24 and 1:48 scale. Windows and Doors This is a very large file. Front Porch and Large Roof Top Use the same pieces as for the 1:24 scale buildings, just trim them to the size you need for your porch or flat mansard roof top. You can also use the printable halloween door decorations and fence sections complete with black cats and rats. Printable stairs and bone railing details for miniature Halloween villages and haunted houses. Photo copyright 2009 Lesley Shepherd, Licensed to About.com Inc.
To make stairs for your haunted house print off a copy of the pdf (acrobat reader) file for the stairs and bone railings which has parts for both sizes of house (which can be used for balcony railings, widows walks and roof crest strips in any scale. The sheet can be printed on lightweight card or photo paper, or printed on regular printer paper and glued to old file folders or a similar weight of card for support. Note: this is a large file and make take some time to download. To Make The Stairs - Cut out a stair section and fold all tabs away from the colored area. Fold the top of the stairs (the part with the lines for the wood) so that the light grey wide sections are the steps and the darker grey sections are the supports or risers for the steps. Fold the and glue the tabs on the black sections (the sides of the steps)under the bottom step and behind the first riser (the one that will touch the ground. Glue the tabs on the back of the steps to the porch on the end or across the front, or to the front of the house under the door. To Make the Bone Railings - Cut out the bone railing sections along the edges, cutting carefully around the ends of the bones. The strips can be used as railings for the porch or steps, or they can be turned with the long bone side down and used as crest strips for the top of a peaked roof. You can also use them to make balcony railings or window box planters (use the smaller scale under windows). Printable miniature Haunted House shutters for Halloween village buildings or silhouettes. Photo copyright 2009 Lesley Shepherd, Licensed to About.com Inc. These shutters can be printed on lightweight card or photo paper, or printed on regular paper and glued to old cardstock, cereal boxes, or file folders. Both sizes of shutters are available on the pdf (acrobat reader) Haunted House Shutters file. The shutters can be mounted beside the windows, or over the windows. You can use small bits of paper as "hinges" if you want the shutters to swing across the windows and glue a shutters on either side of a card backing so both sides have shutter images. If you prefer, you can use shutters by themselves in pairs instead of windows, to show windows closed against a storm. Tear long strips of kraft paper from a used paper bag to make strips to mimic rough siding on a miniature haunted house. Photo copyright 2009 Lesley Shepherd, Licensed to About.com Inc.
To finish the front of this house, strips are torn from a recycled kraft (brown) paper bag. This is an easy technique. Begin by opening up your paper bag along the seam, or by opening used envelopes or packing paper. If your bag (or envelopes or parcel paper) is nice and crisp, you can simplify your process by making sharp fold lines every half inch or so running up and down the longest edge of the paper. If you don't want to fold, you can control the paper by how you tear it. To tear the paper start the tear 1/2 inch or so from the long edge of the bag, and holding the paper firmly down on your work surface, use your thumb and finger to tear a strip down the length of the bag, trying to keep it roughly 1/2 inch wide. You may want to view some of the paper finishing techniques shown in the next step before you tear all your paper. Some techniques are easier to do before the strips are torn. If you decide to finish your miniature siding when it is on your haunted house, just continue tearing strips until you have a large number of them. (It takes at least one large food store bag to cover a large cereal box with miniature siding). Tearing the siding is much easier to do all at once, when you have no glue on your fingers! A cheap, stiff paint brush and matte acrylic paint make three different effects for siding when used on strips of torn kraft (brown) paper. Photo copyright 2009 Lesley Shepherd, Licensed to About.com Inc. There are three easy ways to make your paper siding have a texture similar to wood. All of these techniques use matte paint (to resemble worn paint on old siding) and a stiff, cheap paint brush. In these instructions I have shown the techniques using black paint to make it clearer to see. The effect is much more realistic if you use Victorian paint colors (deep red, teal, green, ochre, or brown) and let the kraft paper show through the paint as if it was the worn exposed wood grain where the paint has worn away. To paint with a dry brush technique, dip your brush in the paint then pounce the paint into the brush by pushing the brush up and down on a plate (or the paint dish), keeping the bristles stiff. Before you stroke your paint lightly over your siding, push the brush into a paper towel or scrap of paper to take off any excess paint. You want the effect to be of scattered dry lines of paint. If you need more paint on any area, go over it a second time with a prepared brush to dry brush a second or third layer. Technique #1 Dry brushing after gluing. - This technique is easy, you apply the siding first, then dry brush the miniature house when the glue is dry. Shown on the right of the photo, (and used on the simple sample house) this technique picks up any wrinkles created as you glued, and catches paint on the rough edges of your siding. Don't worry if you have large paint splotches. The windows and doors will help hide any mistakes. You can always dry brush with a bit of kraft brown color to break up large painted areas if you have to. Technique #2 Dry brushing before gluing. Here you use the same dry brush technique to create a wood grain, by brushing the entire bag before you tear it into strips. This technique means there is no paint on the tears so the edges of the siding show as bare wood on your haunted house. To brush the kraft paper before tearing, make sure your strokes are flowing in the direction you will tear the bag (the longest direction). Technique #3 Dry brushing on crumpled paper. Here you crumple your kraft paper as much as possible, trying to make fine crumple lines which will show as cracks after you have dry brushed the paper. When you have lots of tiny crumple lines, (crumple the paper and pretend you are wringing out a cloth to make them), lay your piece of paper as flat as possible and dry brush over it. This will make a lot of dark lines of paint on your paper, but the torn edges will be free of paint as in technique #2. This technique may make it a bit harder to tear strips of paper as the tear will tend to follow the fold lines. This technique was used on the samples of paper strips on the left of the photo above. Strips of torn kraft paper are overlapped on one edge and glued to a cereal box base to make rough siding on a miniature haunted house. Photo copyright 2009 Lesley Shepherd, Licensed to About.com Inc.
To start setting up your siding on your miniature haunted house, first determine where the center is of the main side of the house. Run a line of glue with a glue stick along the back of your paper strip and starting in the center of your shape (the front of your box, or the center of your flat silhouette), lay your glued strip along the base of the box or house shape, pressing it flat to the base or box. If you are covering a cereal box, you may need to press one hand inside the box against the strip on the outside to make sure the strip is glued securely down. Continue to bring the glued strip around the side of your box (if you are making a house) or onto the back edge of your silhouette. If you will be setting up your house for a scene inside (reached through the back) continue to glue the strip about 1 inch in on the back corner of the house. You can see this on a future step in this set of instructions. Lay each strip so it overlaps the strip beneath, leaving less than 1/2 inch of each strip exposed (less if you are making a smaller scale house, for 1:48 scale it should be less than 1/4 inch apart). If your strip is not long enough to cover three sides of your house, just start another strip touching the edge of the last strip. Real siding doesn't cover three sides of a house in one piece. Just make sure the next strip overlaps the join and any new joins don't line up with old ones. To make effective siding in miniature, torn kraft paper must be layered over the piece beneath it. Photo copyright 2009 Lesley Shepherd, Licensed to About.com Inc.
To make your siding look as real as possible, each piece must be overlapped by the strip above it. Your siding may have large curves on some edges, that is what will make it look natural and rough. Try to lay each piece so it covers the box beneath the paper. If it doesn't cover the box, you can fill in small missed areas with paint. Can you see the mistake on this side of the box? The siding piece here slipped out from the piece above it leaving the top and bottom edges showing. Try to make sure you don't have any areas like this on your box. To fix problems like this, you can sometimes remove the problem piece, gently lift up the piece above where it is to go, and slip the mistake piece in underneath its neighbour above. The sides of a cereal box are completely covered in kraft paper strips to make rough siding on a miniature haunted house for a Halloween display. Photo copyright 2009 Lesley Shepherd, Licensed to About.com Inc. Completely cover all of your box shape for your house (or your silhouette) don't worry about cutting out holes for windows or doors, or cutting out areas where the roof will cross or fold. You can use extra paper strips later to cover joins if necessary. Right now, you want a complete layer of even siding, with all strips running horizontally across your house, avoiding the appearance that your siding is sliding up or down on on end. When you have your basic box covered, set the box aside until the glue has dried, then paint on your finish if you need to. Kraft paper siding is glued across the front and sides of a cereal box and just past the edges on the back of the box in order to make a miniature haunted house. Photo copyright 2009 Lesley Shepherd, Licensed to About.com Inc. If you will be using the back of your box house to set up a scene, or using the house similar to a dolls house, end your siding strips just around the back edge of the box. Don't worry about cutting each strip. When you have finished gluing down all the siding strips across the main front of the house, you can trim and finish the strips on the back. As you add siding to the front of your house, the back of your house box will look like this. A half inch border is left around the sides and base on the back of a cereal box. Edges of the box are then covered with kraft paper to finish the kraft paper siding for a miniature haunted house. Photo copyright 2009 Lesley Shepherd, Licensed to About.com Inc.
To finish the back of a miniature haunted house, measure 1/2 to 1 inch in from the sides of the box back and up from the box base the height of a porch (if you will be putting one on the front of your house). Mark lines for your measurements and trim away the box back as shown in the photo. Take a straight strip of kraft paper with a clean cut, rather than torn, edge and glue it over the back of the box so that it starts at the corner, and folds over the measured edge you just cut, gluing securely inside the box at the corner fold. This will cover the edges of your siding and make a neat finish on the back of your box, allowing you to add wallpaper, window details, or other finishes to the inside of your haunted house. The same technique can be used to neatly finish the edges on a flat house silhouette, by gluing the strip about 1/4 inch from the edge on the front surface, then folding it over the edge and gluing it to the back of the silhouette. 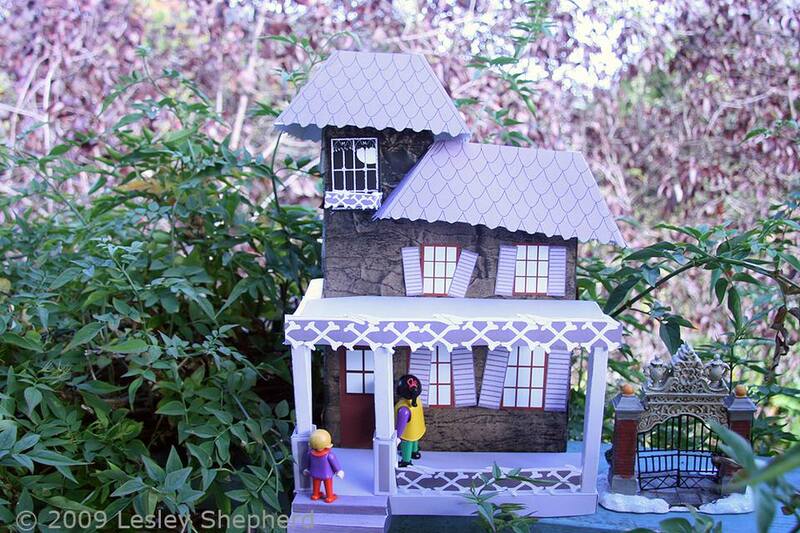 Printable window and door details and a simple Mansard roof are test fitted onto a cereal box to make a haunted house for a Miniature Halloween scene. Photo copyright 2009 Lesley Shepherd, Licensed to About.com Inc. When your siding is dry and finished, choose the details (doors, windows, porches, roofs) you want to add to your structure and test fit them in place. The simplest house facade, a mansard roof which covers the top of the cereal box, is shown here. This is an easy style for a child to build and finish for a home or school project. The same box could have a porch roof and floor installed by gluing the roof across the house and supporting the ends with posts cut to length. The posts supplied in the parts can be folded and glued to make simple square posts, or a slightly larger base can be folded and placed over the post at the bottom for more detail. A simple box for a child can be left without see through windows. An adult may wish to cut out individual window panes and line the window with colored tissue or clear acetate, then place a flickering battery operated tea light in the back of the box to create a safe glow. Real candles are not safe to use in cardboard boxes! A more detailed house can be built from a single cereal box by working out where the porch roof will be attached to the front wall, then cutting across the front of the box above the roof to form a tower on one side of the house, folding the pieces you cut above the roofline back towards the back of the box to make the outer wall of the tower. Two different sizes of mansard roof are provided to make either a rectangular roof that will fit most boxes in one piece, or a smaller square roof for towers. Have fun, the materials are inexpensive, and you can give your imagination free rein.